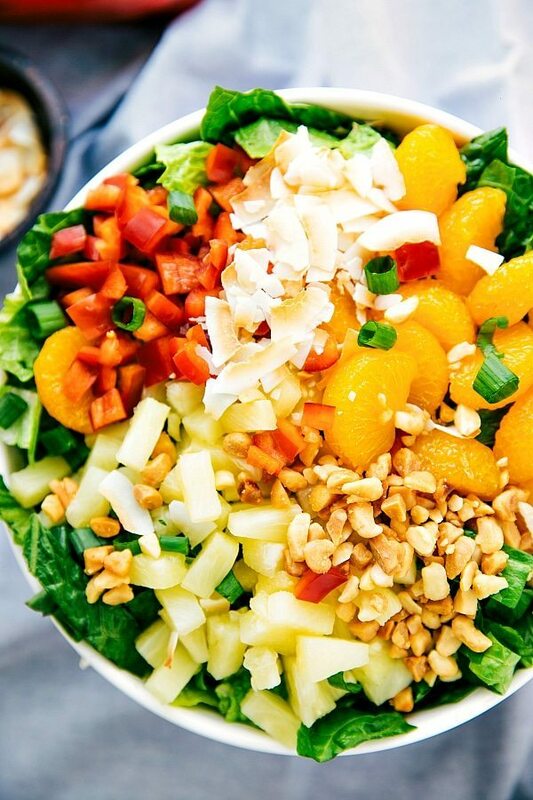 Thank you for supporting the brands that help me to bring you lots of delicious recipes like this amazing tropical pineapple and coconut salad! Salad recipe here on Chelsea’s Messy Apron today and it may just be the most unique one I’ve shared yet! Most of the ingredients are totally normal and mainstream for a tasty salad, but there are a few ones you probably don’t see in a salad too often. Those ingredients? Well, I’m mainly talking about the coconut! 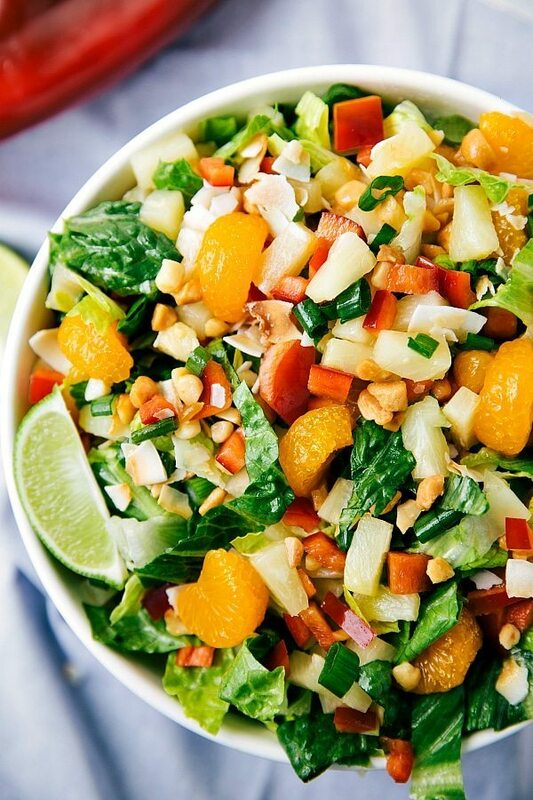 You don’t see coconut in too many salads, but trust me, this is crazy good and it totally works. And then there are macadamia nuts – which don’t appear in salads too often, but they are equally delicious. The other main ingredients include delicious sweet canned fruit (mandarin oranges and pineapple), a crunchy red sweet bell pepper, and some mild green onions. 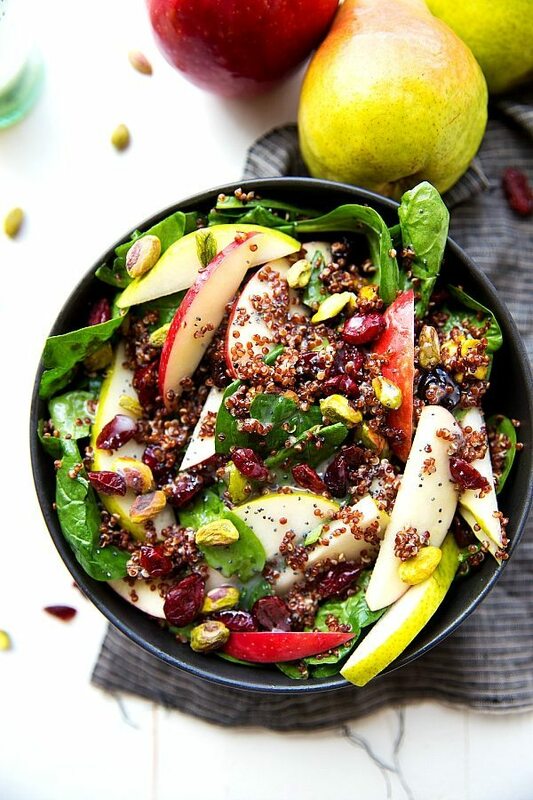 The fusion of these flavors and texture make for a fantastic salad. And we haven’t even talked about the dressing yet! Which is the kind of dressing that will make you want to lick your salad bowl/plate as soon as the salad is gone. It’s tangy, fruity, a little exotic, and also conveniently easy to make. ?? 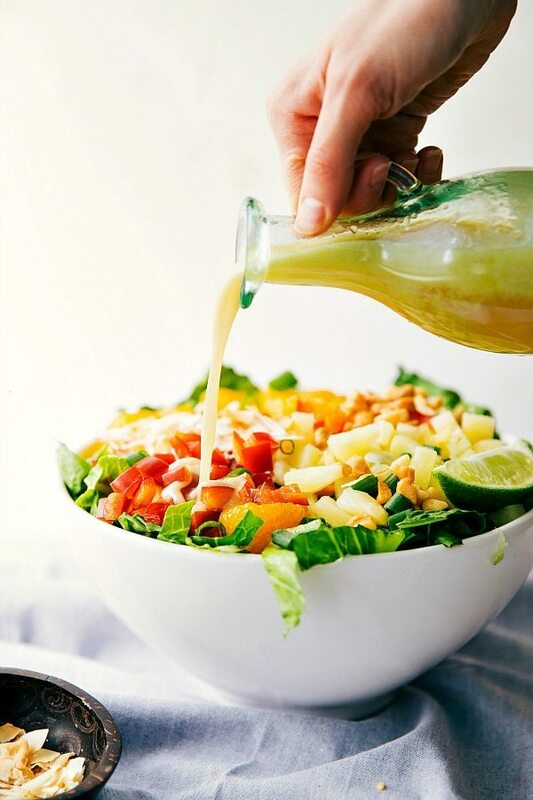 The salad dressing starts with 100% DOLE® Canned 100% Pineapple Juice. It’s 100% juice, non-GMO, and naturally gluten-free! 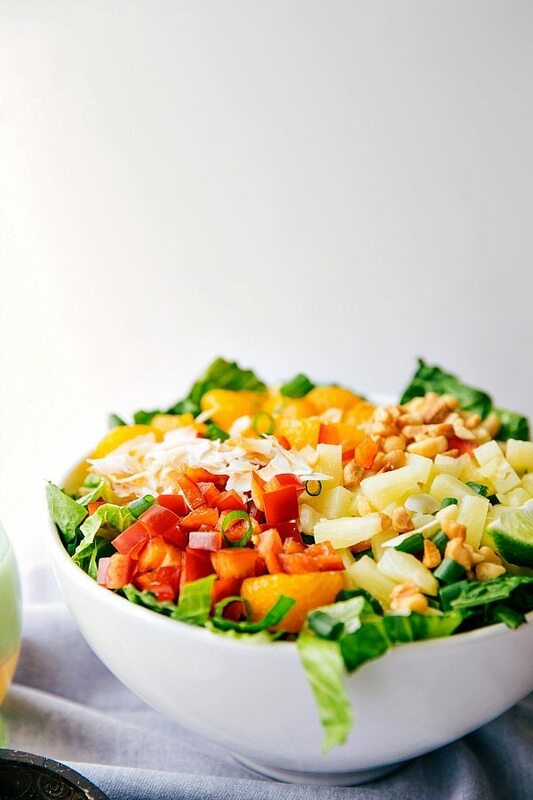 The pineapple juice is the star of the dressing and what gives it such a refreshing and sweet taste. Dole Pineapple juice is known as being the King of Juices™ and for good reason – pineapple juice is incredible! Combine that delicious pineapple juice with a few other easy ingredients, shake them in a jar to combine, and the salad is ready to be enjoyed! To toast the nuts: place the nuts in a single layer in a dry saucepan/skillet (don’t add anything) over medium heat. Stir constantly until the nuts are barely fragrant – just a couple of minutes. Watch carefully as the nuts are VERY easily scorched/burned. To toast the coconut: place the coconut flakes in a dry saucepan/skillet (don’t add anything) over medium heat. Stir frequently until the flakes are mostly golden brown. If you are using sweetened coconut, it browns faster than unsweetened. Chop the romaine lettuce into small pieces to allow for more absorption of the dressing. Thoroughly drain the pineapple and mandarin oranges. Add to the salad. Lightly toast the macadamia nuts and coconut. (See last paragraph of post for directions). Finely chop the green onions and bell pepper (remove stems and seeds) and add to the salad. Combine all of the dressing ingredients in a mason jar, seal, and shake well to combine. The dressing is extremely thin/watery (there is nothing like mayo or dijon mustard to thicken it up), but it's super delicious. Just make sure to dress after serving out the salad and it sticks to the lettuce quite well. Only dress what you will eat as the dressing will make the salad soggy if it sits for a long time. 100% DOLE® Canned 100% Pineapple Juice, the ‘King of JuicesTM, is a natural way to add excitement to your favorite food and drink recipes. It’s a delicious change of pace that always delivers exhilarating flavor. 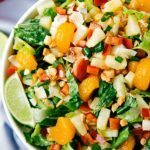 This salad looks so refreshing and tasty! And I love pineapple! With summer coming up I plan on making a ton more salads. Can’t wait to put this one on the menu! This salad was awesome! So fresh and light but filling. I served it for dinner alongside some marinated grilled chicken and that was enough for me and my husband ( who let’s face it sometimes is a bottomless pit). P.S. I bought your ebook and am only halfway thru it, but it has already helped me so much! It is such a great resource and has already increased my blog views. Congratulations on all the success thus far and thank you so much for sharing your tips. They all look so delicious ♥thanks..much for the recipes ..you rock!! The salads look really good.only I would have to substitute another fruit for pineapple because I’m allergic. I like trying different salads I need variety plain is just boring? Thank you so much Candace! 🙂 Hope you enjoy without the pineapple! I attend a slimming club as I’m trying to lose weight. Are all your saleds slimmer friendly? I am making this salad tomorrow. It looks wonderful and refreshing! One question, can I substitute a cup of plain greek yogurt for the oil? Do you think that would still be as flavorful? Thanks Susan! I hope you love it. I’ve never tried using Greek yogurt instead of oil but I’m not sure how great that would work out. The texture and flavor will definitely be different.